Four disposable disc electrodes are pre-gelled and attached to wires in red, blue, black, and green. Four mil carbon film, silver/silver chloride coated. Each box contains 20 or 12 individually sealed sets of 4 leads. Hydrogel has been improved so it stays on the patient better and is still movable. Self adhesive electrodes are easy to repostion and feature a high quality silver/silver chloride sensor for optimum signal quality. Each pack contains four sets with three tab electrodes per set (12 electrodes total). Color coded red, black and green lead wires. When you order 20 or more of the 202380-000 or 10 or more of the 202381-000, you receive the box price discount. 202383-000-060-PK12 is a duckfoot style 28x20mm for better grip. White Leads, 12/Pk. 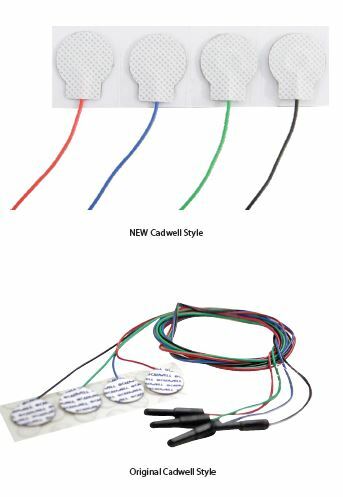 202291-000-010 (12 per pack) & 202291-000-020 (4 per pack) are small duckfoot style 20x15mm surface electrodes with color coded leads (white, green, red, & black).